It was inevitable and shortly after 6:00 a.m. Sunday morning Penn State began blocking off access to the statue of the disgraced former coach in front of Beaver Stadium. The statue will be placed in storage. President Rodney Erickson announced the decision Sunday morning, saying it was a divisive symbol and an "obstacle to healing." According to StateCollege.com, the statue was fully removed at 8:20 a.m. The library will continue to bear Paterno's name. Here is Erickson's full statement. With the release of Judge Freeh's Report of the Special Investigative Counsel, we as a community have had to confront a failure of leadership at many levels. 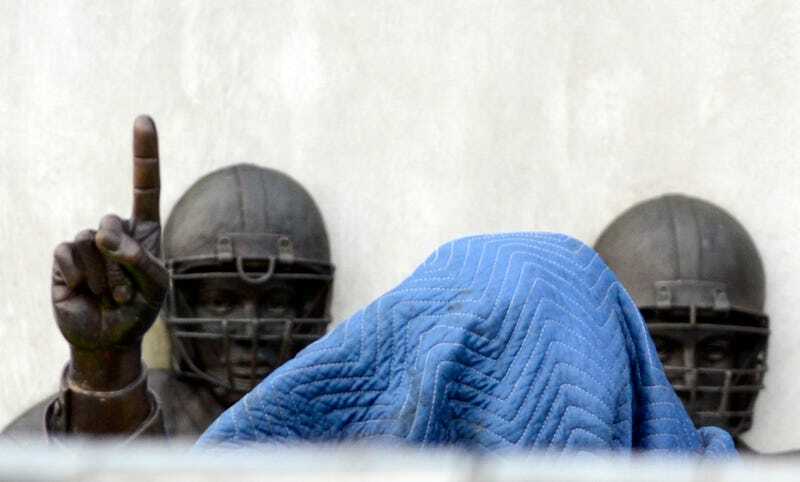 The statue of Joe Paterno outside Beaver Stadium has become a lightning rod of controversy and national debate, including the role of big time sports in university life. The Freeh Report has given us a great deal to reflect upon and to consider, including Coach Paterno's legacy. I now believe that, contrary to its original intention, Coach Paterno's statue has become a source of division and an obstacle to healing in our University and beyond. For that reason, I have decided that it is in the best interest of our university and public safety to remove the statue and store it in a secure location. I believe that, were it to remain, the statue will be a recurring wound to the multitude of individuals across the nation and beyond who have been the victims of child abuse. On the other hand, the Paterno Library symbolizes the substantial and lasting contributions to the academic life and educational excellence that the Paterno family has made to Penn State University. The library remains a tribute to Joe and Sue Paterno's commitment to Penn State's student body and academic success, and it highlights the positive impacts Coach Paterno had on the University. Thus I feel strongly that the library's name should remain unchanged. Coach Paterno's positive impact over the years and everything he did for this University predate his statue. At the same time it is true that our institution's excellence cannot be attributed to any one person or to athletics. Rather, Penn State is defined by our actions and accomplishments as a learning community. Penn State has long been an outstanding academic institution and we will continue to be.